A native of Man-Home, Akari is a happy and easy-going person, who we rarely see angry or upset, a quality which she shares with her supervisor. She is best described as a romantic and seems to find enjoyment in things or events that other people might think humdrum and mundane. Akari often says "Hohe" or "Hahi", which is her short version of "wow". While she is not quite as skilled in rowing as Alice, nor is as familiar with the history of the city as Aika, her carefree and laid-back manner often endears her to the many people she encounters. As such, she seems to make friends very easily and can hold a warm conversation even with complete strangers, a fact that causes her to be labeled as 'mysterious' by her closest friends Aika and Alice. 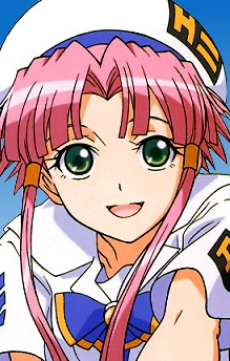 She also accidentally learned how to row back on the gondola back when she was at Man-Home, which Aika states, "Akari is almost invincible when she rows backward" (from the anime and the manga). She is frequently writing letters about her adventures on Aqua to an unnamed person back on Man-home (revealed in the last chapter of the manga); in the anime, these letters are directed to Ai. Later, when Akari passed the test for Prima, she is given the title "Aquamarine" or "Harukanaru Ao" by Alicia meaning distant blue.